For newer members or those who aren’t familiar with the program, Barry’s wife Diane James passed away in Nice, France while they were on a cruise in the Mediterranean Sea in June of 2009. 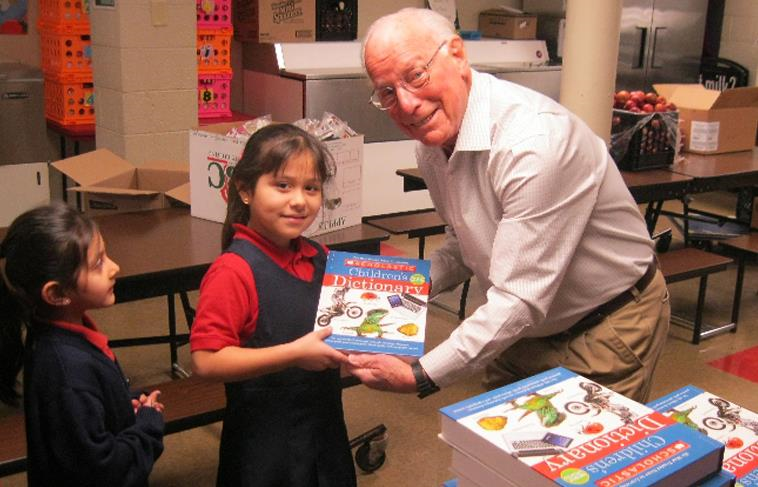 Barry’s two daughters along with Kathy Becker came up with the idea of giving dictionaries to the school children at Capitol West Academy (which is a Charter School) where our Elmbrook Rotary Club was tutoring students who needed to improve their reading skills. It also ties in well with literacy which is one of the key initiatives that Rotary Clubs are involved in. The program began by giving “ Pictionaries “ to grades 1, 2, and 3 and regular dictionaries to grade 4 students at CWA. Then in 2010, we expanded it to include St. Martini Lutheran School and Trowbridge St. School. Now in our seventh year of doing these presentations it's incredible to think that almost 1,500 young students have received the dictionaries. The program has been well received by the schools and of course by the students who have been helped by improving their reading skills while making learning fun. All dictionaries handed out also have a personalized label inside the front cover mentioning the Elmbrook Rotary Literacy Program. Thanks to Barry and Kathy for all their efforts, in addition to Jan Constable and the club for continuing to support this important literacy program.